In Kubuntu or KDE (I think...at least with Beryl), a window can get positioned so that you can't grab the title bar (the bar up top that has the menus on the left and right). To move it, hold down ALT and click anywhere on the window and drag. Shading a window will collapse it into the title bar. To do this, double click on the title bar on top. You will be able to fit a ton of windows on a desktop and not have to go to the task bar, or use the ALT + TAB combination to cycle them. Simply double click them to "unshade??" them. C|Net News.com is reporting today that Dell is now offering Ubuntu Linux as an option for new computers. The article reports that Dell has attempted this before with little success. However, after actually listening to the consumers and realizing that Ubuntu has made great strides towards being a contender for the operating system of choice for the average consumer, Dell is giving it a try once again. Read more about Dell Offers Ubuntu Linux! 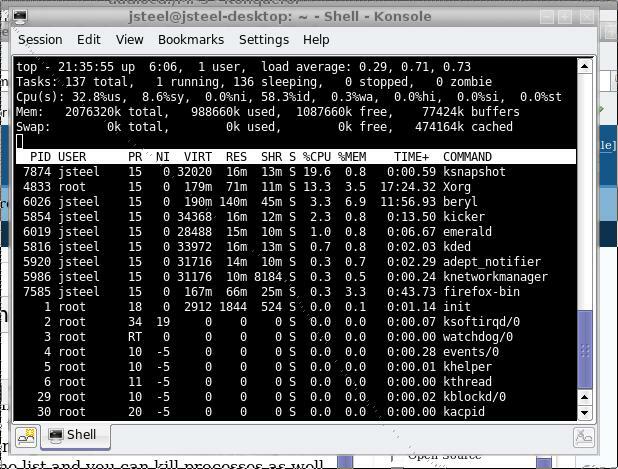 To get real time system information from most Linux systems, use the command top. Open up a command prompt and type top. You'll get a updating readout of processor percentage used, memory percentage used, the amount of memory used by process. There are many ways to sort the list and you can kill processes as well (if you run the command using sudo or root). A must have tool for web developers is Quanta Plus, a multi-purpose development tool. It supports code highlighting for many languages and applications, FTP, projects, plugins and much more. To be honest, I have barely scratched the surface of it's capability. Half the time, it is easier to open a document in Kate and edit it. Kate is the notepad of Linux, but on steroids. Kopete is a multi-network, multi-account instant messenger client for use with Linux systems. I run Kubuntu Fiesty Fawn and use this exclusively. I have two msn accounts, a yahoo account and an AIM account. Kopete supports 11 IM clients out of the box. GnuCash Financial Management is a free, open source alternative to highly priced commercial accounting software. GnuCash provides the tools necessary for personal and business financial management. GnuCash includes everything found in commercial software costing hundreds of dollars including the double entry accounting method, customizable reports, invoices and customer management, job management, budgeting and much more. Here's a good way to get hardware information on a linux system. The proc directory holds the files which store the hardware and system state information. The command ls /proc/ gives me the directory listing. Most of these are files that you can look at. I have been a user of Linux on and off for several years now. I have tried many different "flavors" on many different configurations and types of computers. A few days ago, I got a hold of the latest distribution of the free Ubuntu distribution. Ubuntu is touted as Linux for human beings and I couldn't agree more.